Scorpion’s EXO-AT950 helmet can be worn with or without a visor, with goggles or a face shield, and the chin bar flip ups out of the way. When used with a face shield, a retractable tinted shield provides better visibility in strong sun. This helmet has a polycarbonate shell and is DOT approved. Three shell sizes are used to keep the helmet as light and compact as possible. Generous venting including a closeable mouth-guard vent, a vent above the face shield and two exhaust vents allow plenty of airflow when needed. The Kwickwick II interior liner is soft, comfortable and anti-microbial, and it wicks moisture away from the skin. There are speaker pockets in the comfort liner. The EXO-AT950 starts at $270 in solid colors. Multicolor and camo color schemes are $290. That’s similar to some other helmets with flip-up chin bars, but less than most helmets with flip-up chin bars that also have visors. 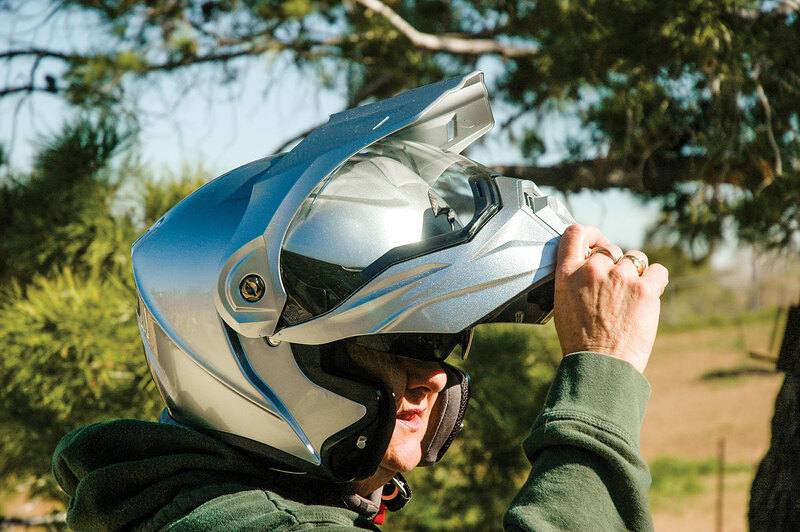 The helmet weighs 3.96 pounds—slightly heavier than conventional helmets—but the EXO-AT950 includes a flip-up chin bar, face shield and sun shield that conventional off-road helmets don’t. Once you get used to the convenience of having a flip-up chin bar, it’s hard to go back. Scorpion’s EXO-AT950 can be used in three modes, so we began riding with it just as it came out of the box—with the face shield on and no visor. It fits well, is very comfortable and the venting works well. The top and bottom vents are closeable for cold-weather riding. The retractable sun shield operates easily with the sliding button on the left side of the helmet, and it provides useful relief from harsh sun. Even so, we added the visor for extra sun protection and tried the helmet without the face shield to wear it with goggles. It works well in dirt-helmet mode with plenty of room for goggle frames. We wore the helmet most with the visor and shield to get a feel for all its features. In this configuration you don’t need to mess with the goggles, and you get to use the sun shield—a very handy feature. The flip-up chin bar may not seem to be a big plus if you’re not used to it, but we quickly liked having the option to lift it to drink from a water bottle or talk to others. Sometimes it’s nice just to get some extra air. Flipping the chin bar up is simple—a single button at the bottom of the chin bar releases it, and you can flip the chin bar up with the shield open or closed. 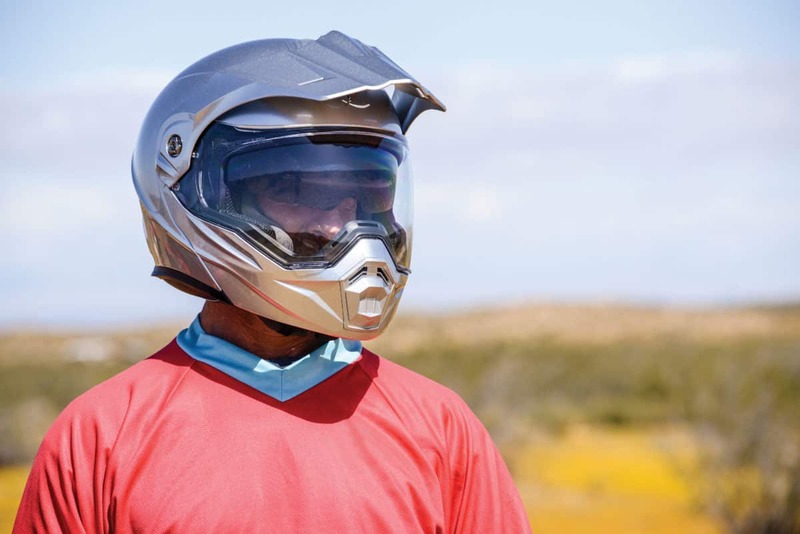 The EXO-AT950 costs more than basic conventional helmets, but it’s far less than other helmets that offer a face shield, sun shield, sun visor and a flip-up chin bar. Best of all, the helmet fits well, has a high-quality look and feel, and its features operate smoothly and solidly.